Come join cheesemaker David Rotsztain for a Community Cheesemaking party. Anyone who has taken one of David’s classes in the past (including the Beginners class earlier this afternoon) is welcome to join this refresher course, and socialize while making a community wheel of cheese. David Asher is a Mayne Island based guerrilla cheesemaker, exploring traditionally cultured, non-corporate methods of cheesemaking. Though mostly self-taught, he picked up his cheese skills from various teachers, including a Brown Swiss cow named Sundae on Cortes Island. David offers cheese outreach to communities around BC through cheesemaking workshops in partnerships with diverse food-sovereignty-minded organizations. 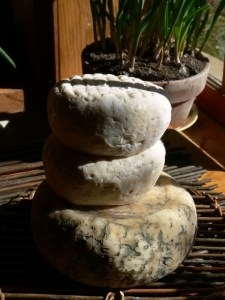 His workshops teach a cheesemaking method that is natural, DIY and well suited to any home kitchen. David has been teaching cheesemaking for over seven years. Join Mayne Island farmer and cheese maker David Asher Rotsztain as we explore the fascinating realm of cheese. David will walk you through the techniques for making three basic styles of fresh cheese: paneer, yogurt cheese and rennet cheese curds, the foundational cheese that can become many different styles of aged cheese. We’ll also talk about kefir, the politics of raw milk, and rennet free cheeses. What to bring: a container or two to take home fresh made cheese and some dairy cultures.